“I have asked China to immediately remove all Tariffs on our agricultural products (including beef, pork, etc.) based on the fact that we are moving along nicely with Trade discussions,” Trump said on Twitter, pointing out that he had not raised tariffs on Chinese goods to 25 per cent from 10 per cent on March 1 as planned. “China and the United States reaching a mutually-beneficial, win-win agreement as soon as possible is not only good for the two countries but is also good news for the world economy,” said Guo Weimin, spokesman for the high profile but largely ceremonial advisory body to China’s parliament. 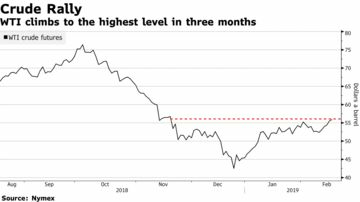 Oil traded near the highest level since November on optimism the U.S. and China can reach a trade deal and as an outage at the world’s largest offshore field in Saudi Arabia signaled tightening supply. Futures in New York rose as much as 1 percent after advancing 5.4 percent last week. President Donald Trump said talks with China were “very productive” as his team returned from Beijing and readied for another round of discussions in Washington this week, raising hopes that a trade war between the world’s largest economies will ease. The Saudis, meanwhile, were said to be repairing a damaged power cable that’s curbed output at the Safaniyah field. Crude’s surged about 24 percent this year as Saudi Arabia and Russia pledged to expand their output cuts, easing concerns that record U.S. production would result in a global glut. More supply is being threatened because of American sanctions against Venezuela and Iran. Reports that the U.S. and China had reached consensus in principle on the main topics in their negotiations further helped boost investors’ risk appetite. West Texas Intermediate for March delivery rose as much as 54 cents to $56.13 a barrel on the New York Mercantile Exchange and traded 49 cents higher at $56.08 at 7:34 a.m. in London. Transactions will be booked Tuesday for settlement because of the U.S. President’s Day holiday. Prices last week posted their biggest gain in more than a month. Brent for April settlement was at $66.65 a barrel, up 40 cents, on the London-based ICE Futures Europe exchange. It gained 6.7 percent last week. The global benchmark crude’s premium over WTI for the same month narrowed to $10.19, after widening to the biggest spread in more than three months on Friday. Conciliatory signals from the world’s two biggest economies are calming fears Washington will ratchet up tariffs before a March 1 deadline. “Big progress being made on soooo many different fronts!,” Trump said on Twitter Sunday. Worries about the trade war worsening a global slowdown are receding at a time when OPEC and its allies are accelerating their implementation of the oil-production cuts agreed in December. The Organization of Petroleum Exporting Countries reported a strong start to the latest round of supply reductions, with the Saudis pledging to cut beyond agreed levels. The impact of the outage at Safaniyah, which has the capacity to pump 1.2 million to 1.5 million barrels of mostly heavy-sour crude a day, could be damped as seasonal refinery maintenance works across Asia and the U.S. typically peak around now. Saudi Arabian Oil Co. said in statement that all its facilities were “safe and normal,” without elaborating on the situation at Safaniyah. US President Donald Trump is televised discussing the southern border wall as traders work on the floor at closing bell of the Dow Industrial Average at the New York Stock Exchange on January 10, 2019 in New York. Wall Street stocks declined in early trading on Friday following tepid US inflation data, while General Motors surged on a strong profit forecast. About 10 minutes into trading, the Dow Jones Industrial Average stood at 23,875.88, down 0.5 percent. The broad-based S&P 500 and tech-rich Nasdaq Composite Index also shed 0.5 percent, with the former at 2,583.66 and the latter at 6,951.19. The Consumer Price Index, which tracks costs for household goods and services, fell by 0.1 percent last month from November, the first decline since March, as falling fuel prices masked steady gains in food and shelter costs. The new figures confirm the view of Federal Reserve bankers that they can hold off on raising interest rates again any time soon in the absence of inflation pressure. US stocks have risen the last five sessions on dovish reassurances from Fed officials and hopes over US-China trade talks will yield a deal. Still, some analysts say stocks could be primed to retreat after the strong run due to technical factors. Among individual companies, General Motors surged 7.0 percent after forecasting better-than-expected profits for 2018 and 2019 following job cuts announced in December. Its updated advice warns that US citizens have been arbitrarily prevented from leaving the country. The warning comes as two Canadian citizens remain in detention in China. Former diplomat Michael Kovrig and businessman Michael Spavor were arrested last month as relations between the two countries worsened. The pair face accusations of harming national security and, on Thursday, China’s top prosecutor said they had “without a doubt” violated the law. Separately, three US citizens were accused of committing “economic crimes”and barred from leaving China in November. “Individuals not involved in legal proceedings or suspected of wrongdoing have also been subjected to lengthy exit bans in order to compel their family members or colleagues to co-operate with Chinese courts,” the state department said in a separate warning issued last January. Dual-citizenship is not allowed under Chinese law, and the state department has warned that US-Chinese nationals can be detained and denied US assistance in China. It advises travelling on a US passport with a valid Chinese visa and asking officials to notify the US embassy immediately if you are detained or arrested.